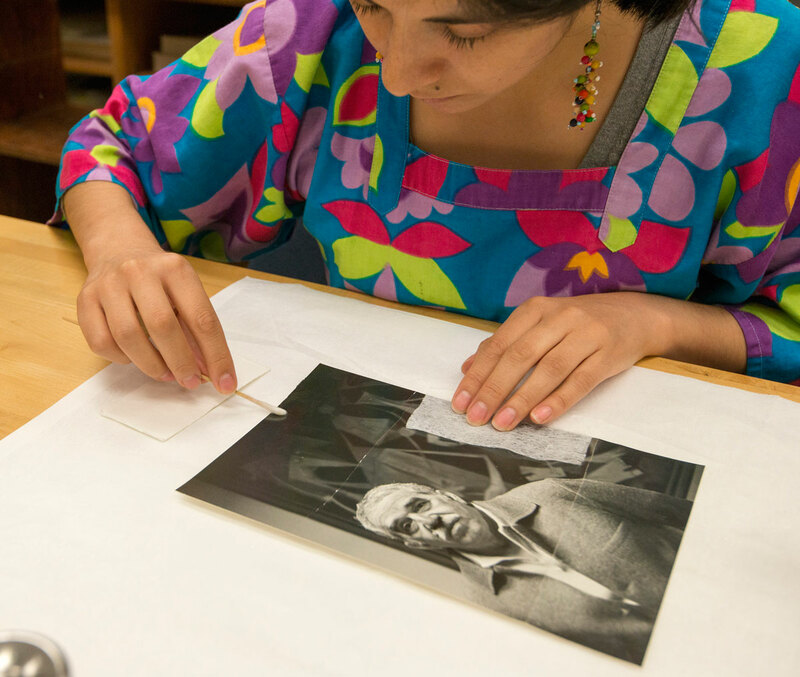 Photograph conservator Diana Diaz-Cañas is one of 30 staff from across The University of Texas at Austin to receive a 2016 Outstanding Staff Award. Recognized for their invaluable contributions, the work of this select group of recipients has had a significant impact on the University. For the past three years, Diana’s contributions to the Ransom Center have furthered its mission to preserve its holdings. In 2014-15 alone, Diana treated 1,061 items from 96 different projects intended for exhibition, loan, identification of photographic technique, housing and stabilization, documentation, and mold cleaning. 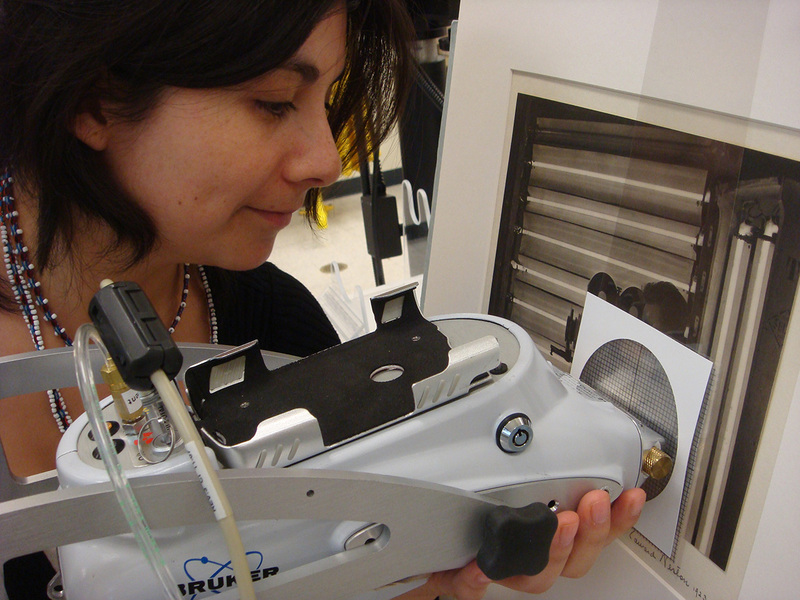 Diaz performing XRF Scientific Analysis on a photograph at the Amon Carter Museum of American Art, Fort Worth, TX. Photo by Sylvie Pénichon. Her work has included the family photo album of J. M. Coetzee and photographs included in Walker Evans’s 1941 publication Let Us Now Praise Famous Men. She also worked with the Center’s book conservators to treat two photo albums by Charles Dodgson (Lewis Carroll) for the Alice’s Adventures in Wonderland exhibition. In addition to work she performed for Alice’s Adventures, she treated a range of photographs for the Center’s most recent exhibitions, including The World at War, 1914-18; The Making of Gone with the Wind; Wildly Strange: The Photographs of Ralph Eugene Meatyard; Frank Reaugh: Landscapes of Texas and the American West; and Shakespeare in Print and Performance. Diana also treated ten photographs by Walker Evans that the Center loaned for exhibition in the 2015 Venice Biennale, All the World’s Futures. Diana’s remarkable conservation work has made it possible for researchers and museum visitors around the world to study, enjoy, and be inspired by these important photographs. 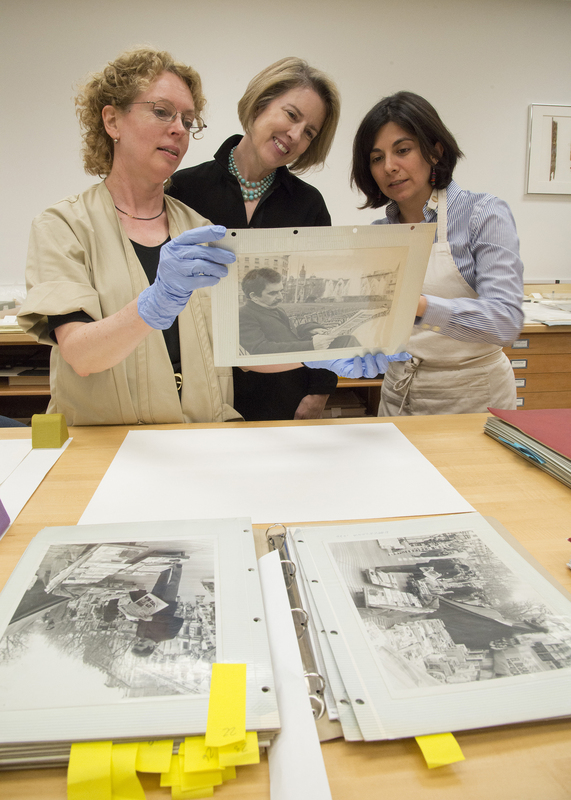 Conservators Barbara Brown (L) and Diana Diaz (R) with Dr. Ellen Cunningham-Kruppa, Associate Director and Head, Conservation and Preservation Division, discussing issues of photographs stuck to “magnetic” album pages. All of Diana’s talents and skills came to bear tenfold in preparing for and participating in the recent symposium Gabriel Garcia Marquez: His Life and Legacy, co-hosted by the Ransom Center and the LLILAS Benson Latin American Studies and Collections. Diana did critical work to support the opening of the archive to researchers. She translated and checked translations for many materials made available to the press and the public to ensure that extensive information about the collection was available to Spanish-language audiences. She also spoke with many reporters from around the globe about the conservation work the Ransom Center has done on the archive, and was featured in press coverage across Latin America. Diana is a tremendous asset to the Ransom Center, caring for and preparing collections for exhibit that reach the Center’s diverse audiences. Congratulations to Diana! Diana Diaz-Cana is such a talented woman. She is a knowledgeable and skilled photographic conservator. She also has bilingual abilities of such a high level that she is asked to translate and review materials for public use, including use by the press, a task often passed on to another department.